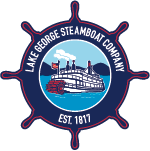 The Lake George Steamboat Company is immensely proud of its boats and history. We would not have such history and longevity if it were not for our very own dry dock (built in 1927) which we use to bring our ships out of the water and service them. Our dry dock is rather unique in today’s age because unlike the floating dry docks which are abundant along the lakes, rivers, coasts, and canals of America, our dry dock is a Marine Railway. We are quite proud of our Marine Railway, especially since in 2010 it was added to the National Register of Historic Places. What is a Marine Railway? A Marine Railway consists of a flat track which extends far out into the water over a very gradual slope. Our marine railway extends some 300 feet out into the lake. On this track lays a long and fairly wide cradle, which sits on cast iron rollers. The cradle gets pulled by big chains up and down the track. The chains are operated by several gears and a motor which is housed inside of the head house at the top of the track. 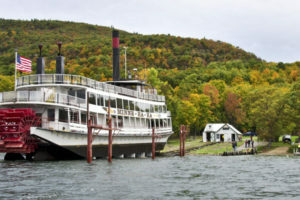 The Delaware and Hudson Railroad company purchased the Lake George Steamboat Company in 1871. 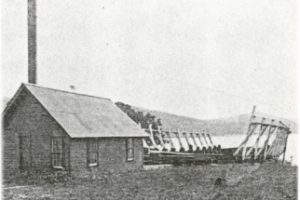 It owned and operated a small dry dock in the area during that time to launch its smaller vessels, but over time the company kept building larger and larger ships. In July of 1927 that old Marine Railway was found insufficient to haul the “Sagamore” for repairs (after the Sagamore had sunk in 15 feet of water) and the Crandall Dry Dock Company was immediately contracted to build; and did so, the present Marine Railway. 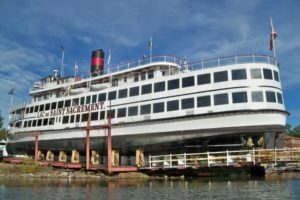 The dry dock was built in roughly 4 months and was made available to the company to haul the “Sagamore” on December 5th of that year. This is the same railway the Lake George Steamboat Company has maintained and operated into the present day. 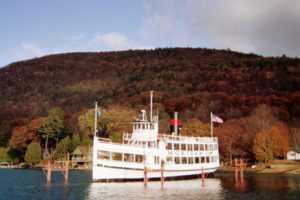 In 1939, The Great Depression and the obvious approaching of America’s involvement in World War II having decimated the Lake George passenger business, the D&H Railroad sold the Lake George Steamboat Company and all its assets to one of its then Captains, George Stafford. After years of liquidating assets, George finally decided to sell the entire company, and in 1946 George Stafford sold it to Wilbur Dow. From 1946 to the present we have maintained the Railway in operating condition, repeatedly hauled our three vessels on the Railway and successfully secured control of the properties adjacent to the Railway.